Traffic is affected at Moolchand underpass, Bihari Colony under the railway bridge on road No. 57 and Chhatrasal Stadium main gate red light due to waterlogging. 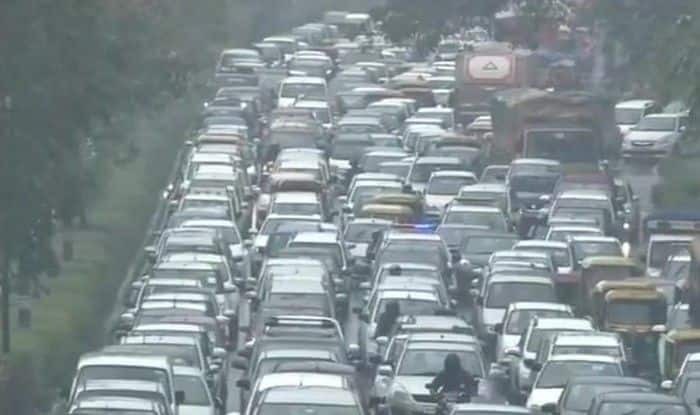 New Delhi: Heavy rains and thunder lashed Delhi and the National Capital Region (NCR) on Tuesday morning which led to traffic jams and waterlogging at several areas. Traffic is affected at Moolchand underpass, Bihari Colony under the railway bridge on road No. 57 and Chhatrasal Stadium main gate red light due to waterlogging. Waterlogging and traffic congestion has also been reported in Ghaziabad and Noida region. Traffic slowed down across the city and visibility was low because of the darkened skies. The downpour also caused temperatures to dip in the region and also helped improve the air quality of the national capital. As per the IMD, another western disturbance would affect Northwest India from January 24 onwards. Reportedly, the national capital will receive rainfall for the entire week. “Generally cloudy conditions with light to moderate rainfall at most places and isolated thunderstorm activity accompanied with strong surface winds most likely during January 21 and 22,” the weather department said. The weatherman also predicted fresh snowfall in Jammu and Kashmir, Himachal Pradesh and Uttarakhand. “The sky will remain generally cloudy throughout the day with chances of light rain or thundershowers. There are also possibilities of an isolated hail storm,” a met official said, adding that gusty winds could add to the chill. Delhi and its neighbourhood have been witnessing bouts of rain and thundershowers since Monday afternoon. The showers continued during evening and night leading to a drop in temperature. On Monday, a wall of a warehouse collapsed in Delhi’s Najafgarh, due to heavy rains thus killing two workers and injuring another. Police identified the deceased as Jasvir and Karim. Both hailed from Bulandshahr in Uttar Pradesh. The cops have registered a case under relevant sections of the Indian Penal Code in connection with the matter.